The case of the elusive source of methane on Titan, Saturn's largest moon, could soon come to a close, some astronomers say. A new model suggests that instead of storage within surface lakes or an ocean, methane lies inside an icy crust and periodic changes release it into the atmosphere. 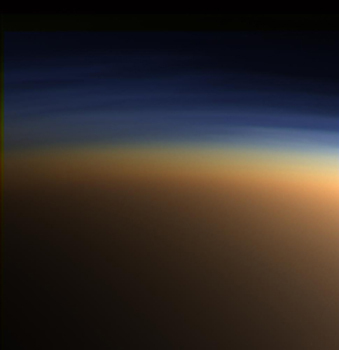 On March 31, 2005, a camera aboard the Cassini spacecraft captured this natural-color image of Titan's atmosphere. The orange haze contains methane, which is periodically replenished. Image is courtesy of NASA/JPL/Space Science Institute. Nitrogen and methane in Titan's atmosphere react under sunlight to give Titan its hazy orange appearance. But these reactions irreversibly destroy that methane, so some mechanism must be actively replenishing the gas to keep the moon's skies glowing. With thoughts of a possible moon wide liquid methane ocean as the source, scientists sent the Cassini-Huygens spacecraft to Titan for a closer look. The mystery only grew, however, when orbital and ground images revealed recently carved river-like channels and lake-like beds  with only a hint of methane lurking beneath the surface, but no oceans (see Geotimes, February 2006). A new model, however, proposed by Gabriel Tobie, a researcher at the University of Nantes in France, and colleagues, accounts for the current channels and lake beds, as well as the lack of liquid methane on the surface. In the March 2 Nature, Tobie and colleagues put forth a model that shows how Titan's interior could have released methane during three thermal episodes in the moon's history. What the researchers proposed for Titan, also takes place on Earth: Ice-like structures, or "gas hydrates," trap gas (often methane) at the bottom of Earth's oceans, where low temperatures and high pressures keep the icy complexes stable. Some geologists think that during several periods in Earth's history, rises in ocean temperatures triggered the release of significant amounts of methane into the atmosphere (see Geotimes, November 2004). Similarly on Titan, Tobie and colleagues modeled how pressure and temperatures might have allowed methane-rich hydrates to form as an ice crust that covers a liquid ammonia-water ocean that still exists there today. Warming and cooling periods that stemmed from Titan's deep interior may have caused massive releases of methane into the moon's atmosphere. The first episode began early in the moon's history when it began to form a core out of a mixture of silicates and ice, Tobie and colleagues wrote. About the same time, a methane hydrate crust formed over a liquid ammonia-water ocean. The insulating crust helped warmed the ocean below, releasing some of the trapped methane into the atmosphere. The second episode, the team wrote, began about 2 billion years later, as radioactive heating in the rocky core triggered convection and a consequent burst of heat. The heat thinned the icy crust thereby releasing methane, which may have migrated to the surface through cracks in the crust. Finally, about 2 billion years after the second episode, a third (and final) episode initiated as convection from the core slowed and the moon started to cool. The model suggests that as the water-ammonia liquid below the crust began to freeze, plumes of heat could be released into the methane-rich crust, forcing the transfer of more methane into the atmosphere. This third episode, says Jonathan Lunine, a researcher at the Lunar and Planetary Laboratory at the University of Arizona in Tucson, who helped create the model, could have released enough methane to account for the current inventory of atmospheric methane, and specifically data from the Huygens probe, which measured about 5 percent methane in Titan's atmosphere close to the moon's surface. That's enough gas to produce a methane rainfall from time to time and carve the features on the moon's surface, the researchers say. The best thing about the model, according to John Osegovic, a senior chemist at MDS Research in St. Petersburg, Fla., who is not associated with the research, is that it has the potential to be tested. Future flybys could measure how much the planet flexes under the influence of Saturn  a characteristic influenced by the distribution of internal material  and could help researchers determine if a subsurface ocean and core are present. Also, the researchers suggest that the first two episodes would have deposited widespread methane reservoirs on the surface, leading to erosion different from the more localized features created by the current volcanic activity. Future images and dating of surface structures, Lunine says, could either confirm or deny the model's depiction of Titan's methane history.